The National Intercollegiate Flying Association (NIFA) Region VIII Competition was held last week at the Transportation Education Center (TEC) and Southern Illinois Airport. Participating schools included Indiana State University, Lewis University, Purdue University, Quincy University, and SIU Carbondale. The awards banquet was on Saturday evening. 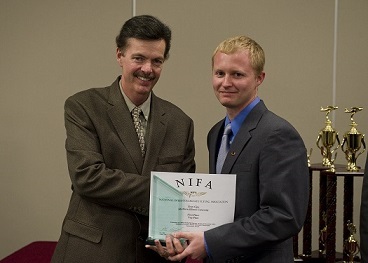 Our Flying Salukis are the NIFA Region VIII Champions again! As a matter of fact, our Flying Salukis made a clean sweep of the competition. In addition to being the Region VIII Champions, we were the Ground Events Team Champions, and the Flying Events Team Champions. 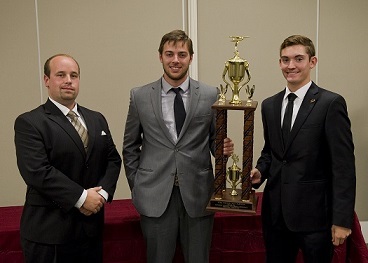 Sean Gipe was the Top Scoring Male Pilot and the Top Overall Pilot Award Winner. Emily Frasca was the 2nd Place Top Scoring Female Pilot. We scored 349 overall team points. The second place team (Lewis University) scored 145 overall team points. We scored 204 points more than our closest competitor. 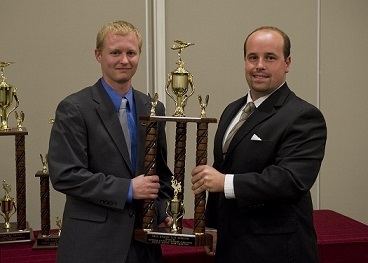 This is the seventh regional title in eight years that Flying Salukis have won for this annual NIFA regional competition series. These awards are testament to the hard work and dedication of Aviation Management and Flight students, faculty, and staff to continually improve program quality and deliver above and beyond expectations. The Flying Salukis Team roster follows: John Behnke, Jacob Schwarz, Aaron Applebee, Matt Benson, Prescott Dean, Jon Dowell, Emily Frasca, Sean Gipe, Kevin Grandberry, Greysen Harlow, Teddy Keenan, Michael Maughan, Davin Miles, George Nimmer, Joshua Sager, Brad Smith, Dalton Thompson, and Kindra Wendling. Coaches are Head Coach - Jimmy Libuszowski, Assist. Coach - Kim Carter, Assist. Coach - Mike LeFevre and Assist. Coach - Stephanie Armstrong. Thank you all for a great job done. We are so proud of you! Kudos to Professor Bryan Harrison for organizing a tremendous event. Please join us in congratulating Flying Salukis for their sweeping victory during the NIFA Region VIII Competition last week!